Peritoneal dialysis (PD) is a well-accepted alternative to haemodialysis, which proved to be safe and effective mode of renal replacement therapy for patients with the end-stage renal disease. It allows patients more freedom to perform daily activities compared to haemodialysis. Peritoneal catheter placement, first developed in 1968, was thought to be the key to successful PD. Care taken at the time of placement of the catheter for PD can minimise transfers to haemodialysis. Thus, it is critical for the nephrology team to engage with the process to ensure appropriate placement of PD catheter. Conventionally, PD catheters have been inserted using a small laparotomy and blind placement of the catheter in the pelvis. 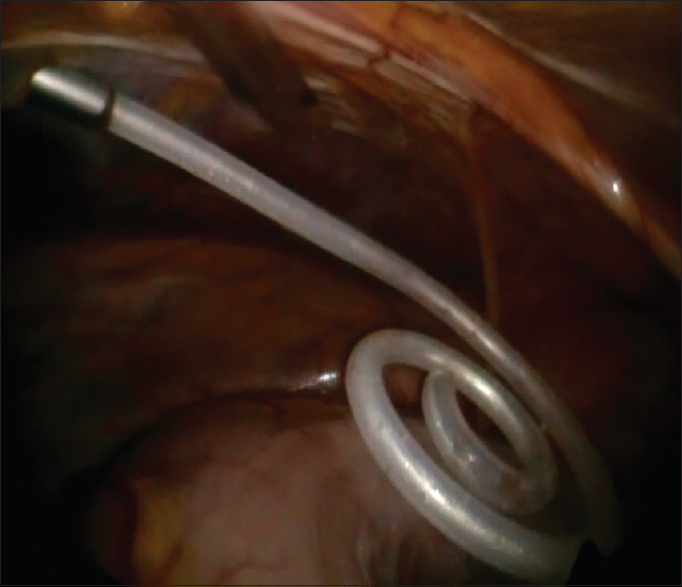 This technique has been associated with catheter obstruction rates as high as 36%. Other techniques have since been described that use fluoroscopy, peritoneoscopy and laparoscopy. However, there is a lack of consensus in the literature as to the preferred operation. Quite a few research papers compared the advantages and disadvantages between open and laparoscopic insertion of PD catheters and suggested different conclusions. Several authors found a benefit with laparoscopic insertion, while the others showed, they were equivalent in complications and catheter survival., Despite different opinions of experts and different results of randomised clinical trials and meta-analyses, laparoscopic insertion of PD catheter is becoming widely accepted method for gaining of peritoneal access. Majority of PD catheters are constructed out of silicone, which is less irritating to the peritoneum. Cruz catheter is made of polyurethane, which is stronger than silicone and allowing catheter to be thin-walled with large lumens. 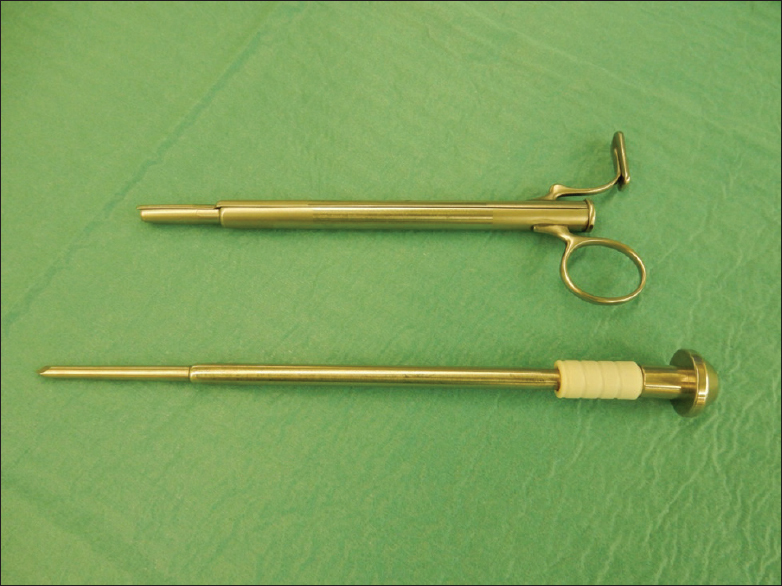 In our institution, we use Tenckhoff catheters with curved tip and two Dacron cuffs [Figure 1]. PD catheter can be divided into three segments. Intraperitoneal segment is located inside the peritoneal cavity, extraperitoneal or intramural part is located inside the abdominal wall, and the external part is seen from the outside. In our institution, laparoscopic insertion of PD catheter is a standard method for providing a peritoneal access in adults. This paper describes step-by-step laparoscopically assisted insertion of PD catheter (LAIPDC), as we perform it in our institution. The patient is placed in a supine position. Perioperative antibiotic prophylaxis with cefazolin is recommended 30–60 min before the procedure., The operative field is prepared in a standard sterile manner. The anterior abdominal wall in peppered with a sterile foil. The upper border of coiled tip of the PD catheter is aligned with the upper border of the pubic symphysis, the position of the inner (preperitoneal) cuff, outer (subcutaneous) cuff and skin exit site is marked [Figure 3]. The inner cuff should be placed in a preperitoneal space approximately 1–2 cm laterally from the median line; the outer cuff should be placed subcutaneously lateral to the inner cuff. 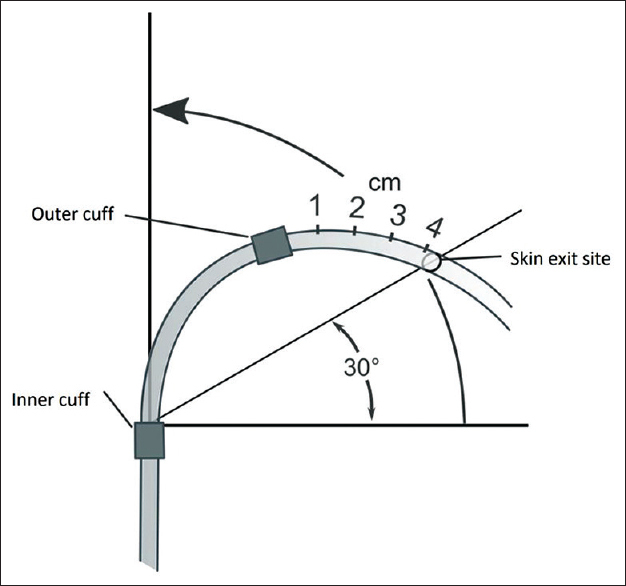 The skin exit site of the PD catheter should be at least 2 cm lateral from subcutaneous cuff, but the optimal distance is 4 cm [Figure 4]. Laparoscopy is performed in a standard manner. A transverse skin incision in made just above the umbilicus, and pneumoperitoneum with carbon dioxide (CO2) is created with Veress needle. The intraabdominal CO2 pressure is maintained at 12 mmHg. A 5 mm port and camera are inserted above the umbilicus. The abdominal cavity, especially the Douglas pouch, is inspected for any pathology or adhesions. 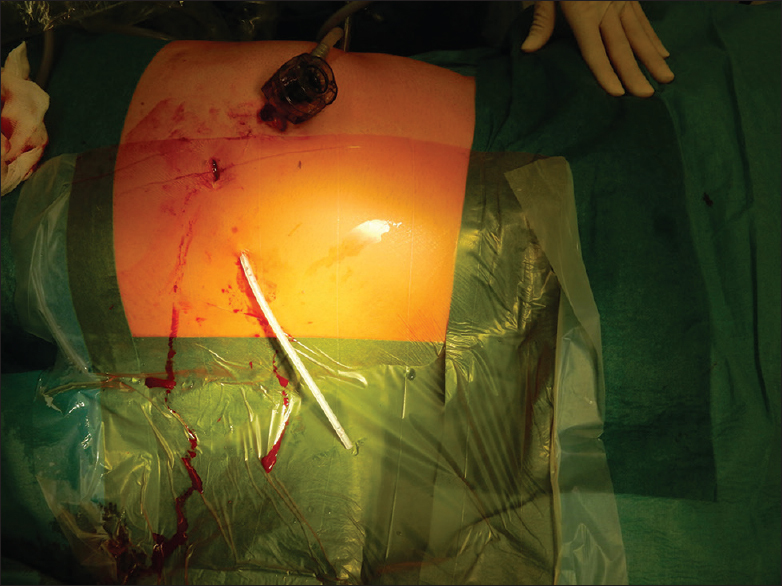 We use another 5 mm port on the left or right side of the anterior abdominal wall for a laparoscopic grasper [Figure 5]. After laparoscopy and initial exploration of abdominal cavity, we perform a small transverse skin incision, where we have previously marked the position of outer (subcutaneous) cuff. 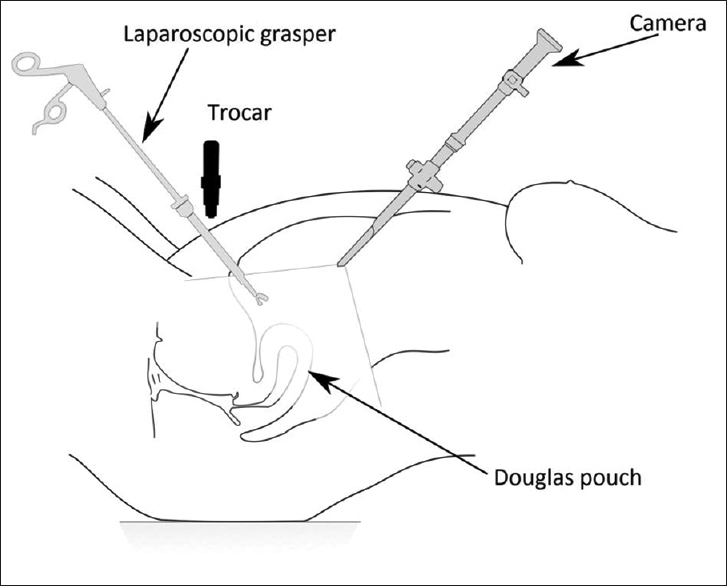 With special trocar we perform a rectus sheath tunnelling [Figure 6]. Rectus sheath tunnelling effectively keeps the catheter oriented towards the pelvis, eliminates pericatheter hernias and reduces the risk of pericatheter leaks. The peritoneum is penetrated, and a guide is removed from the trocar. PD catheter is introduced into the peritoneal cavity, the inner cuff is placed in the preperitoneal space and the trocar is removed. It is important, that the inner cuff is not within the peritoneal cavity [Figure 7]. We use standard Tenckhoff catheters with curved tip and two Dacron cuffs [Figure 1]. With a laparoscopic grasper we grab the curved end of PD catheter and put it into the Douglas pouch. Then we check that there is no bleeding from the port sites that the end of the PD catheter is placed in the Douglas pouch and the inner cuff is placed preperitoneally. Camera and trocars are removed. The PD catheter is placed laterally on the left or right side of the anterior abdominal wall [Figure 8]. The outer cuff is placed subcutaneously, and the skin exit site should be 2–4 cm lateral from the subcutaneous cuff. Skin wounds are closed with intradermal resorbable sutures. We do not fix the PD catheter with a suture because the rectus sheath tunnelling obviates the need for suturing the catheter tip to a pelvic structure and both cuffs provide sufficient fixation. 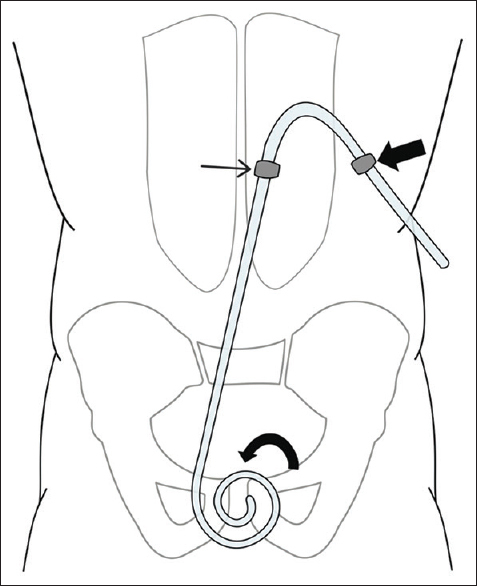 Measures taken to prevent PD catheter malfunction at the time of primary placement are proper rectus sheath tunnelling, oriented towards the pelvis and placement of the intraperitoneal portion of PD catheter between the parietal and visceral peritoneum towards the pouch of Douglas and the PD catheter should not be placed within the loops of the bowel or directly in omental tissue. The fixation of the catheter tip on the pelvic organs is a feasible option to prevent catheter tip dislocation, however, if the catheter is inserted properly, both cuffs provide sufficient catheter fixation and catheter tip fixation with suture is not needed.,, Some surgeons perform omentopexy or partial omentectomy for avoiding omental entrapment of the catheter tip. However, according to SAGES guidelines, omentopexy or partial omentectomy should be employed selectively since it may be unnecessary when omwntum in short or adherent to previous upper abdominal sites., We do not perform routine catheter tip fixation, omentopexy or partial omentectomy is performed selectively. After procedure, the patient is transferred to the nephrology department. The goals of post-operative care are to minimise bacterial colonisation of the exit site and tunnel during the early healing period, to prevent trauma to the exit site and traction on the cuffs by immobilisation of the catheter and to minimise intra-abdominal pressure to prevent leakage. The abdominal cavity should be flushed with small volumes until the effluent is clear. It is recommended to wait for 10–14 days before starting regular PD. We have analysed data from 38 patients, who had a laparoscopic insertion of the PD catheter in the past 2 years. There were no minor or major complications immediately after surgery or within 30 days from surgery. One patient had a catheter malfunction 3 months after primary insertion, with obstruction of outflow and later also inflow of the dialysate fluid. The cause of the obstruction was an omental wrap around the catheter tip. We performed a laparoscopic lysis of the omental tissue from the catheter tip. The same patient developed a minor umbilical hernia 2 months after the laparoscopic salvage of the PD catheter obstruction. The umbilical hernia was surgically repaired. In two patients, we had to remove the PD catheter because of catheter-related peritonitis that could not be managed conservatively with antibiotics. Resuming all our complications from 38 patients, who had a laparoscopic insertion of PD catheter, we had one catheter obstruction, one post-operative hernia and two catheter-related intra-abdominal infections. Our experiences with laparoscopic insertion of PD catheter are very positive, and we believe, that laparoscopic insertion of PD catheter is a safe and effective method for providing peritoneal access, with minor complications. Xie H, Zhang W, Cheng J, He Q. Laparoscopic versus open catheter placement in peritoneal dialysis patients: A systematic review and meta-analysis. BMC Nephrol 2012;13:69. Attaluri V, Lebeis C, Brethauer S, Rosenblatt S. Advanced laparoscopic techniques significantly improve function of peritoneal dialysis catheters. J Am Coll Surg 2010;211:699-704. Buffington M, Sequeira A, Sachdeva B, Abreo K. Peritoneal dialysis catheter placement techniques. Open Urol Nephrol J 2012;5:4-11. Peppelenbosch A, van Kuijk WH, Bouvy ND, van der Sande FM, Tordoir JH. Peritoneal dialysis catheter placement technique and complications. NDT Plus 2008;1:iv23-8. Crabtree JH. SAGES guidelines for laparoscopic peritoneal dialysis access surgery. Surg Endosc 2014;28:3013-5. Haggerty S, Roth S, Walsh D, Stefanidis D, Price R, Fanelli RD, et al. Guidelines for laparoscopic peritoneal dialysis access surgery. Surg Endosc 2014;28:3016-45. Anon. Guidelines for peritoneal dialysis access. Indian J Nephrol 2005;15:80-6. Al-Dohayan A. Laparoscopic placement of peritoneal dialysis catheter (same day dialysis). JSLS 1999;3:327-9.